NEC’s ProgrammableFlow® Switches PF5240 and the PF5248 both earned the OpenFlow Switch Specification 1.0.1 certificate. Testing of NEC’s switches was conducted by the Indiana Center for Translational Research and Education (InCNTRE). The ONF OpenFlow Conformance Testing program was introduced in July 2013, and works with independent labs approved for ONF testing. Once the test specification requirements are met, the certificate of conformance is issued, validating that a company is using current technology and is guaranteed to accurately implement the OpenFlow specification. 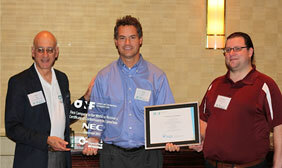 This certification from ONF underlines NEC’s commitment to OpenFlow standards and to innovative network solutions. Vendors with certified products assert their commitment to both the OpenFlow specification and the benefits it provides customers, including interoperability and best-of-breed network solutions resulting in cost-effective networks delivering business agility. It is interesting to note that Red Hat previously certified NEC ProgrammableFlow Networking Suite for the OpenStack Neutron plug-in. And earlier this year the ProgrammableFlow virtual switch for Hyper-V, the PF1000, was certified by the Microsoft Server 2012 team. To pilot NEC’s ProgrammableFlow Networking Suite and the certified switches, please contact your NEC account manager or your local NEC reseller. More information on NEC’s award-winning SDN solutions can also be found at www.necam.com/sdn. Integrated network and compute orchestration will soon be generally available for all Microsoft Windows Server 2012 R2 Hyper-V customers using R2, System Center Virtual Machine Manager , and NEC ProgrammableFlow® Networking Suite. We first demonstrated this unified, intelligent, and open virtualization solution at TechEd in June, documented here on NEC Today for our followers. As of Nov. 1, 2013, Microsoft and NEC joint customers will command new levels of IT flexibility and automation with dynamic management and allocation of pooled network resources, as well as their compute and storage pools, all from a central point of control. Up to now, even as virtual machines and storage have been readily migrated and allocated to applications, the associated networks have presented a bottleneck to delivery of services. The manual processes and complexity of conventional networks have limited the agility of network services. 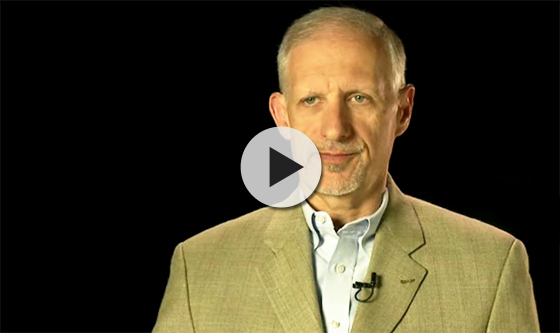 Furthermore, traditional network designs have limited performance and throughput. The NEC ProgrammableFlow Network Suite integrates OpenFlow-based Software-Defined Networking (SDN) with Server Virtualization Management (VM), provisioned and orchestrated by System Center Virtual Machine Manager. This integration simplifies additions, deletions and changes to large-scale Hyper-V environments. When administrators create a virtual network in the System Center Virtual Machine Manager workflow, ProgrammableFlow SDN dynamically provisions network services. The virtual and physical network policy is deployed automatically. Because the ProgrammableFlow Networking suite uses the OpenFlow protocol, both the physical switch and Hyper-V extensible vSwitch (together with the PF1000) are dynamically provisioned and controlled, enabling complete integration of network and workload policy. These settings can also be done remotely in the Hyper-V host, enabling lower operational costs by automating network management settings such as VLAN settings for VM. 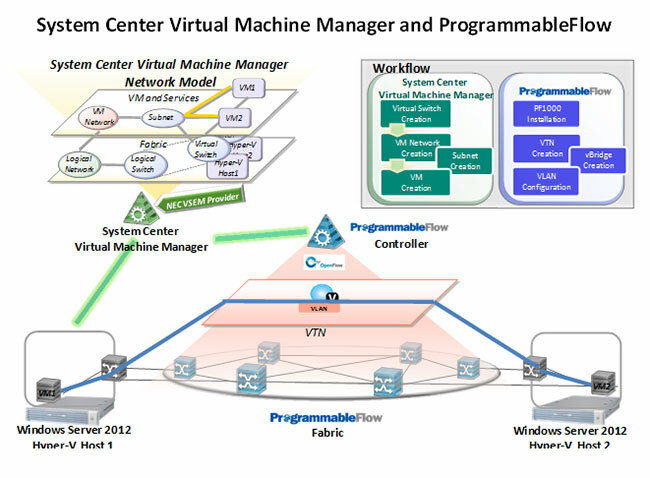 As depicted here, when a VM is created in System Center Virtual Machine Manager and is connected to a ProgrammableFlow network, the workflow will be automatically mapped to the network – without the administrator knowing ProgrammableFlow-specific operations. NEC is also pleased to announce that the ProgrammableFlow PF1000 vSwitch has been certified under the Windows Server 2012 R2 program. This program identifies hardware and software solutions that meet Microsoft standards for compatibility and recommended practices with the respective Windows Server operating systems. NEC’s ProgrammableFlow PF1000 is the first OpenFlow-based vSwitch certified under the Windows Server 2012 program. The ProgrammableFlow PF1000 is available for download free from NEC. For information on the ProgrammableFlow PF6800 controller, integrated with System Center Virtual Machine Manager, see your Microsoft or NEC reseller, or visit http://www.necam.com/sdn today.